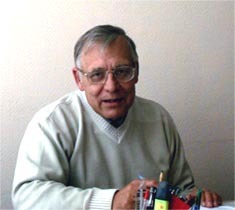 Zelensky Alexander Alexeyevich, born in 1943, Professor, Doctor of Technical Sciences, graduated from the Kharkov Aviation Institute in 1966. On getting a qualification of radio engineer, he started to work as an assistant at the "Department of receiving-transmitting devices". All his subsequent research and educational activities are associated with this department: since 1969, Senior Instructor, since 1975, Associate Professor, since 1984, the Head of the Department. The following cources: "Radio transmitting devices", "SHF devices and engineering ", "Electronic and quantum devices of SHF" have been reading for the years for the students studying at the Radio-Technical faculty. During the recent several years he teaches the following courses: "Radio communications systems", "Fundamentals of construction and technology of satellite communication systems", "Telecommunication systems and networks", and also the course "Introduction into the major subject" for the first year students training in the major subject "Technologies and Means of Telecommunication". The start of A.A. Zelensky's research activity was directly related with the excitation problems of high-stability asynchronous fluctuations in multiresonance systems and with an analysis of fluctuation processes. These studies supervised by Professor Barzhin, Doctor of Technical Sciences, laid the foundations for a trend line of researchers, i.e. "Multifrequency precision piezo-electronics", which has been successfully developing up to now in the Department. Zelensky A.A. defended the Ph.D. thesis in 1972. Since 1978, in addition to the problems of creating the multifrequency devices, the problems of digital processing of multifrequency signals have been solved that finally became a separate line of investigation dealing with the processing of wide-band signals and fields. As a result A.A. Zelensky defended of doctoral thesis in 1989 concerning the methods for formation and processing of images in multichannel measuring systems used for different purposes. The above investigations set the adequate background for a new generation of scientists (there are 12 candidates and 1 Doctor of Technical Sciences now at the Department). Zelensky Alexander Alexeyevich has more than 200 articles, 135 author lisences and patents for the inventions, he wrote about 30 manuals. He is the chairman of the specialized academic council on awarding of scientific degrees of a Doctor of Technical Sciences in the area of radio-technical and telecommunication systems and devices at the National aerospace university named by N.E. Zhukovsky. In 1993 A.A. Zelensky was elected the full Member of the Academy of Sciences of Applied Radio Electronics of the Ukraine, Russia and Byelorussia and in 2003 he was elected the full Member of the Academy of Sciences of Communication of the Ukraine. The Head of the Department, Professor, Dr. Techn. Sci. Associate Professor, Cand. Techn. Sci. Senior lecturer, Cand. Techn. Sci.